Software inertia – Many companies and organizations have a lot of man-years and millions of dollars invested in their Fortran Software. There is a reluctance to change due to this investment as well as the difficulty involved in getting a reliable software translation. 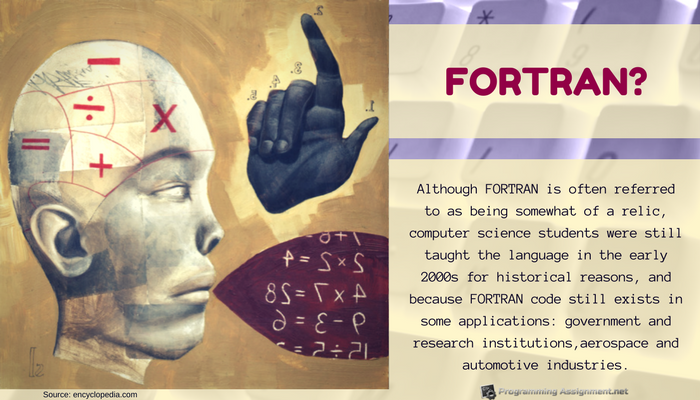 So much information exists in Fortran that there is a reluctance to change – In fields such as physics and astronomy so much exists in Fortran that scientists are hesitant to change. However, there is a trend that may render this particular point obsolete. There have been many versions of Fortran since the 1950s and despite opinions to the contrary Fortran continues to be used for many mathematical computations. Help with Fortran homework assignments – Our Fortran programming experts can assist you with completing your Fortran homework assignment in a timely manner and ensure that if it is error free. Fortran personal tutoring – A personal Fortran programming tutorial can be designed for those individuals who need extra help. Our tutors will evaluate your current skills and programming level, and customize a programming tutorial to fit your specific needs. When you need the best in programming help, contact us for programming assistance that meets the most exacting standards!